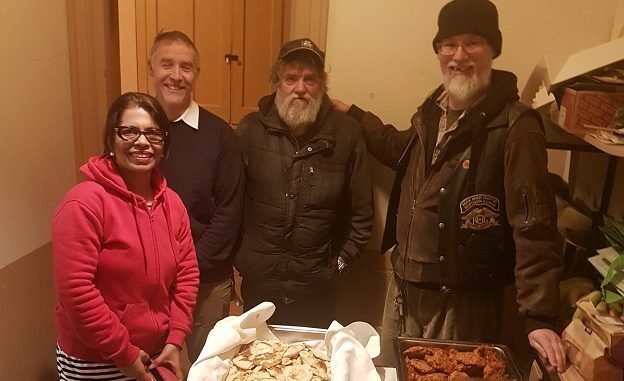 Scores of people are brought together every week at a community kitchen in Ramsgate for those who are homeless, drug or alcohol addicted or isolated. The St George’s Community Meal project at St George’s Church hall runs throughout the year -shutting for just three weeks – and has just been awarded another six months funding through the diocese. Every Tuesday people who may struggle day to day, suffer mental health or addiction problems, are homeless or isolated and socially excluded, gather together to share a meal and some company. Community Meal manager Nigel Clarke says the kitchen is ‘a little gem that does not get seen’ but provides community and relationships for hundreds of people. He said: “This last year we have had almost 300 different individuals come through the doors. Worryingly Nigel says he has witnessed a huge spike in the number of people coming to the meals who are homeless due to problems with Universal Credit benefit and a downturn in the economy. He said: “The last three months there has been a massive upturn in the number of homeless people and those sofa surfing. A lot of them are on the street for the first time. This is due to Universal Credit and a downturn in the local economy. This is hitting small businesses and people are losing their jobs. The St George’s volunteers work with a variety of organisations and churches to help people outside of the community meal too. The team has also recently created a sheet which gives people information of where they can get hot meals, drinks, wash their clothes, use shower facilities and get clean clothes. 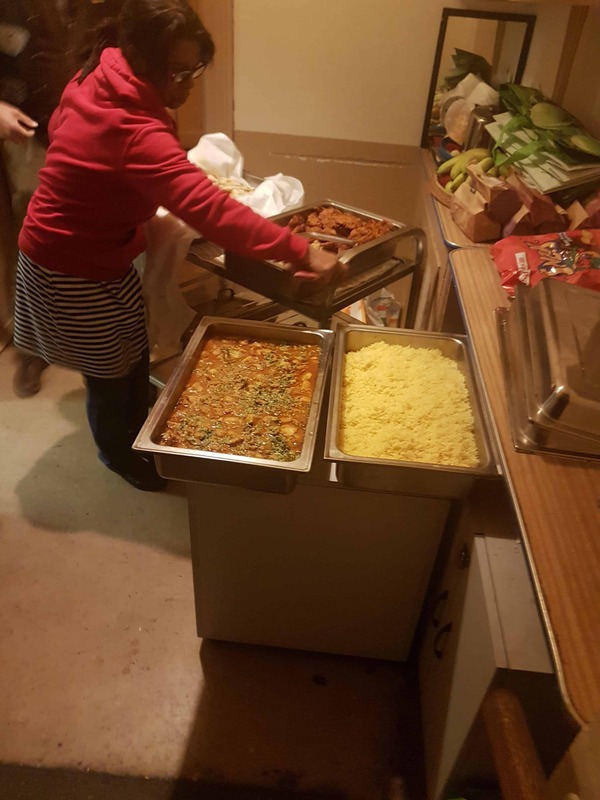 Tonight (November 20) Ramsgate Tandoori restaurant owner Raushan Ara supplied and cooked the meal for at least 40 visitors. 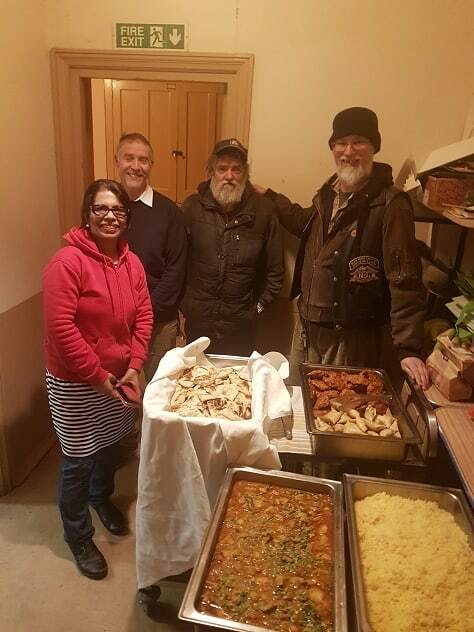 Raushan has also worked with the Thanet Winter Shelter scheme – which opened yesterday and runs until the end of March providing meals, beds and help for those who are rough sleeping – since it began in 2016. Previously the community kitchen has run in tandem with the shelter but due to demand the two schemes are running separately this year. The St George’s Community Meal runs from 5.30pm every Tuesday. I know that the Salvation Army provides a large number of meals each week too and food parcels. Very impressive! The people involved in this are true heroes. They should be given medals, and knighthoods and peerages. Like so many others, the people involved in this project are having to pick up the pieces while we continue to suffer governments run for bent Bankers and tax-dodging businessmen. Nice to see there’s some good people out there, helping others who are suffering. Well done done your super stars.